In centrifuge dewatering centrifugal force is used to accelerate the separation of solid and liquid phases of the liquid sludge stream. The process involves clarification of the sludge and its compaction. Centrifuges separate the sludge into de watered sludge cakes and clarified liquid, which is called centrate. Centrifugation has some inherent advantages over vacuum filtration and other processes used to dewater sludge. It is simple, compact, totally enclosed, flexible, can be used without chemical aids, and the costs are moderate. Industry particularly has accepted centrifuges in part due to their low capital cost, simplicity of operation, and effectiveness with difficult-to-dewater sludges. The most effective centrifuges to dewater waste sludges are horizontal, cylindrical - conical, solid bowl machines. Basket centrifuges dewater sludges effectively but liquid clarification is poor. Disc-type machines do a good job of clarification but their dewatering capabilities leave much to be desired. Centrifuges are being installed in more and more wastewater treatment plants for the following reasons: (1) the capital cost is low in comparison with other mechanical equipment, (2) the operating and maintenance costs are moderate, (3) the unit is totally enclosed so odors are minimized, (4) the unit is simple and will fit in a small space, (5) chemical conditioning of the sludge is often not required, (6) the unit is flexible in that it can handle a wide variety of solids and function as a thickening as well as a dewatering device, (7) little supervision is required, and (8) the centrifuge can dewater some industrial sludges that cannot be handled by vacuum filters. The disadvantages associated with centrifugation are: (1) without the use of chemicals the solids capture is often very poor, and chemical costs can be substantial; (2) trash must often be removed from the centrifuge feed by screening; (3) cake solids are often lower than those resulting from vacuum filtration; and (4) maintenance costs are high. treatment plant sometimes resist settling and as a result, their concentrations in the treatment system gradually build up. The centrate from raw sludge dewatering can also cause odor problems when recycled. Flocculents can be used to increase solids captures, often to any degree desired, as well as to materially increase the capacity (solids loading) of the centrifuges. However, the use of chemicals nullifies the major advantage claimed for centrifuges — moderate operating costs. As noted, three basic types of centrifuges are disc-nozzle, basket, and solid bowl. The latter two types have been used extensively for both dewatering and thickening. The disk-nozzle centrifuge is seldom used for dewatering sludge, but is used more for sludge thickening in the industrial sector. Because the solid bowl design has undergone major improvements throughout the history of its use, this method is used more than any other to dewater sludge. Because of recent improvements in solid bowl centrifuge design, solid concentrations can reach 35%. The solid bowl conveyor centrifuge operates with a continuous feed and discharge rates. It has a solid-walled imperforated bowl, with a horizontal axis of rotation. These centriffiges are enclosed, so they have a limited odor potential compared with other dewatering methods. The laydown area, access area, and centrifuge required space for a large machine (200 m to 700 gpm of sludge feed) is approximately 400 square feet. Compared to other mechanical dewatering machines, this space is significantly smaller. 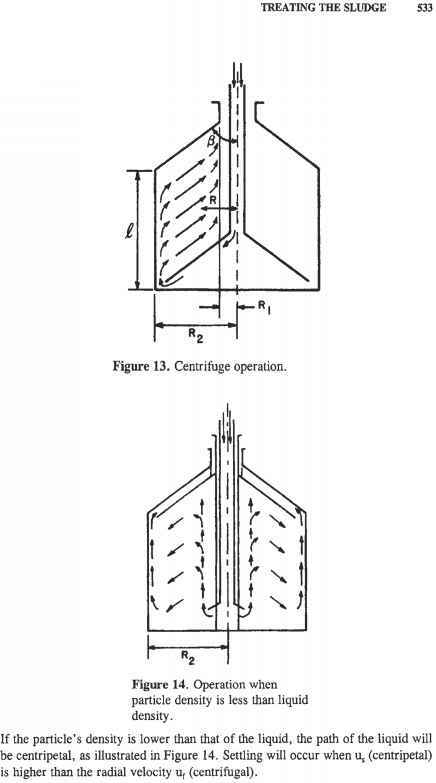 An example of a continuous horizontal solid-bowl centrifuge is illustrated in Figure 11. It consists of a cylindrical rotor with a truncated cone-shaped end and an internal screw conveyor rotating together. The screw conveyor often rotates at a rate of 1 or 2 rpm below the rotor's rate of rotation. The suspension enters the bowl axially through the feed tube to a feed accelerated zone, then passes through a feed port in the conveyor hub into the pond. The suspension is subjected to centrifugal force and thrown against the bowl wall where the solids are separated. The clarified suspension moves toward the broad part of the bowl to be discharged through a port. The solid particles being scraped by the screw conveyor are carried in the opposite direction (to the small end of the bowl) across discharge ports through which they are ejected continuously by centrifugal force. As in any sedimentation centrifuge, the separation takes place in two stages: settling (Figure 11, in the right part of the bowl), and thickening or pressing out of the sediment (left-hand side of the bowl). Figure 11. Continuous solid-bowl centrifuge. Because the radius of the solid discharge port is ususally less than the radius of the liquid overflow at the broader end of the bowl, part of the settled solids is submerged in the pond. The remainder, closer to the center, is inside the free liquid interface, where they can drain before being discharged. The total length of the "settling" and "pressing out" zones depends on the dimensions of the rotor. Their relative length can be varied by changing the pond level through suitable adjustment of the liquid discharge radius. When the pond depth is lowered, the length of the pressing out zone increases with some sacrifice in the clarification effectiveness. The critical point in the transport of solids to the bowl wall is their transition across the free liquid interface, where the buoyancy effect of the continuous phase is lost. At this point, soft amorphous solids tend to flow back into the pond instead of discharging. This tendency can be overcome by raising the pond level so that its radius is equal to, or less than, that of the solids discharge port. In reality, there are no dry settled solids. The solids form a dam, which prevents the liquid from overflowing. The transfer of solids becomes possible because of the difference between the rotational speed of the screw conveyor and that of the bowl shell. The flights of the screw move through the settled solids and cause the solids to advance. To achieve this motion, it is necessary to have a high circumferential coefficient of friction on the solid particles with respect to the bowl shell and a low coefficient axially with respect to the bowl shell and across the conveyor flights. These criteria may be achieved by constructing the shell with conical grooves or ribs and by polishing the conveyor flights. The conveyor or differential speed is normally in the range of 0.8 % to 5 % of the bowl's rotational speed. The required differential is achieved by a two-stage planetary gear box. The gear box housing carrying two ring gears is fixed to, and rotates with, the bowl shell. The first stage pinion is located on a shaft that projects outward from the housing. This arrangement provides a signal that is proportional to the torque imposed by the conveyor. If the shaft is held rotational (for example, by a torque overload release device or a shear pin), the relative conveyor speed is equivalent to the bowl rotative speed divided by the gear box ratio. Variable differential speeds can be obtained by driving the pinion shaft with an auxiliary power supply or by allowing it to slip forward against a controlled breaking action. Both arrangements are employed when processing soft solids or when maximum retention times are needed on the pressing out zone. The solids handling capacity of this type centrifuge is established by the diameter of the bowl, the conveyor's pitch and its differential speed. Feed ports should be located as far from the effluent discharge as possible to maximize the effective clarifying length. Note that the feed must be introduced into the pond to minimize disturbance and resuspension of the previously sedimented solids. As a general rule, the preferred feed location is near the intercept of the conical and cylindrical portions of the bowl shell. The angle of the sedimentation section with respect to the axis of rotation is typically in the range of 3 to 15°. A shallow angle provides a longer sedimentation area with a sacrifice in the effective length for clarification. 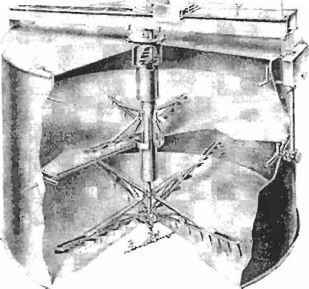 In some designs, a portion of the conveyor flights in the sedimentation area is shrouded (as with a cone) to prevent intermixing of the sedimented solids with the free supernatant liquid in the pond through which they normally would pass. In other designs, the clarified liquid is discharged from the front end via a centrifugal pump or an adjustable skimmer that sometimes is used to control the pond level in the bowl. Some displacement of the adhering virgin liquor can be accomplished by washing the solids retained on the settled layer, particularly if the solids have a high degree of permeability. Washing efficiency ranges up to 90% displacement of virgin liquor on coarse solids. Some configurations enable the settled layer to have two angles; comparatively steep in the wetted portion (10-15°) and shallow in the dry portion (3-5°). A wash is applied at the intersection of these angles, which, in effect, forms a constantly replenished zone of pure liquid through which the solids are conveyed. The longer section of a dry shallow layer provides more time for drainage of the washed solids. In either washing system, the wash liquid that is not carried out with the solids fraction returns to the pond and eventually discharges along with the effluent virgin liquor. Let's consider the following example in order to get a better appreciation for the application of the above expressions. In this problem oil droplets (dp = 10-4 m, pp = 900 kg/m3, n = 10'3 cP) are to be separated in a sedimentation centrifuge. The machine operates at 5000 rpm (« = 2ir x 5000/60). If the distance of a single droplet from the axis of rotation is 0.1 m, determine the droplet's redial settling velocity. 45 = 10"4 x 1000 ur/10"3 ur = 0.45 m/sec. Note that the above calculations are based on nonhindered sedimentation and, therefore, should be modified for a hindered "fall." Estimating Capacities of Tubular- and Solid-Bowl Centrifuges: When a rotating centrifuge is filled with suspension, the internal surface of liquid acquires a cylindrical geometry of radius R,, as shown in Figure 11. The free surface is normal at any point to the resultant force acting on a liquid particle. If the liquid is lighter than the solid particles, the liquid moves toward the axis of rotation while the solids flow toward the bowl walls. The flow of the continuous liquid phase is effectively axial. A simplified model of centrifuge operation is that of a cylinder of fluid rotating about its axis. The flow forms a layer bound outwardly by a cylinder, R2, and inwardly by a free cylindrical surface, R, (Figurel3). This surface is, at any point, normal to a resulting force (centrifugal and gravity) acting on the solid particle in the liquid. The gravity force is, in general, negligible compared to the centrifugal force, and the surface of liquid is perpendicular to the direction of centrifugal force. Consider a solid particle located at distance R from the axis of rotation. The particle moves centrifugally with a settling velocity, u, while liquid particles move in the opposite direction centripetally with a velocity Uf where V - volume (m3), t = time (sec), and C = height of the bowl (m). 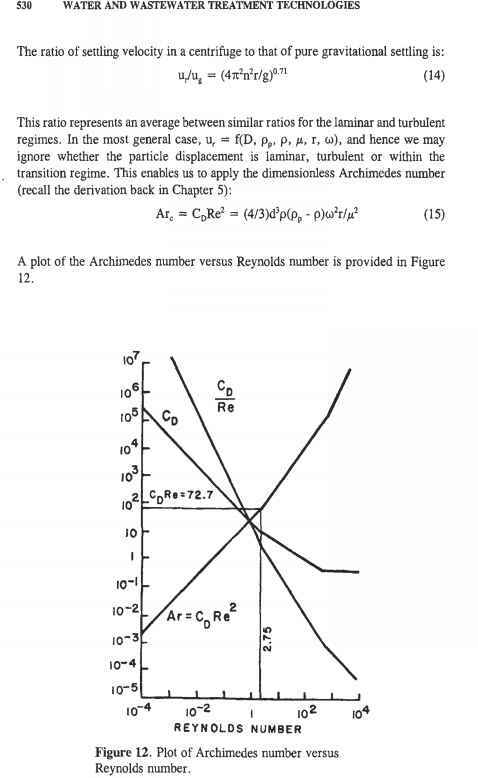 The settling capacity for a given size of particles is a function of R, (and us, which itself is proportional to R. In general, for the sedimentation of heavy particles in a suspension it is sufficient that the radial component of % be less than us at a radius greater than R2. Because of turbulence effects, it is generally good practice to limit the settling capacity so that us again exceeds uf near Rj. The same situation occurs when the particles are lighter than the continuous liquid. The relation between us and R depends on the regime. In the laminar regime, us is proportional to R, whereas in the turbulent regime, it is related to ^R. Most industrial sedimentation centrifuges operate in the transition regime. Disk-Bowl Centrifuges - Disk-bowl centrifuges are used widely for separating emulsions, clarifying fine suspensions and separating immiscible liquid mixtures. Although these machines are generally not applied to wastewater applications, and are more usually found in food processing, they can find niche applications in water treatment. 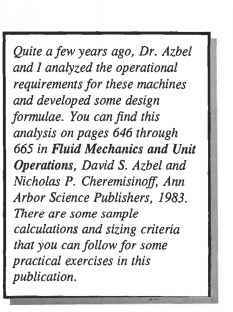 More sophisticated designs can separate immiscible liquid mixtures of different specific gravities while simultaneously removing solids. Figure 15 illustrates the physical separation of two liquid components within a stack of disks. The light liquid phase builds up in the inner section, and the heavy phase concentrates in the outer section. The dividing line between the two is referred to as the "separating zone." For the most efficient separation this is located along the line of the rising channels, which are a series of holes in each disk, arranged so that the holes provide vertical channels through the entire disk set. These channels also provide access for the liquid mixture into the spaces between the disks. Centrifugal force causes the two liquids to separate, and the solids move outward to the sediment-holding space. Figure 15. Separation is achieved by use of stack discs. The position of the separating zone is controlled by adjusting the back pressure of the discharged liquids or by means of exchangeable ring dams. Figure 16 illustrates the main features of a disk-bowl centrifuge, which includes a seal ring (1), a bowl (2) with a bottom (13); a central tube (18), the lower part of which has a fixture (16) for disks; a stack of truncated cone disks (17), frequently flanged at the inside and outer diameters to add strength and rigidity; collectors (3 and 4) for the products of separation; and a feed tank (5) with a tube (6). The bowl is mounted to the tube (14) with a guide in the form of a horizontal pin. This arrangement allows the bowl to rotate along with the shaft. The suspension is supplied from the feed tank (5) through the fixed tube (6), to the central tube (18), which rotates together with the bowl and allows the liquid to descend to the bottom. In the lower part of the bowl, the suspension is subjected to centrifugal force and, thus, directed toward the periphery of the bowl. The distance between adjacent disks is controlled by spacers that usually are radial bars welded to the upper surface of each disk. The suspension may enter the stack at its outside diameter or through a series of vertical channels cut through the disks, as described earlier. The suspension is lifted up through vertical channels formed by the holes in the disks and distributed simultaneously under the action of centrifugal force into the spacings between the discs. These spacings are of tight tolerances and can range from 0.3 to 3 mm. Figure 16. Details of the disc-bowl centrifuge. Due to a larger diameter, the disk bowl operates at a lower rotational speed than its tubular counterpart. Its effectiveness depends on the shorter path of particle settling. The maximum distance a particle must travel is the thickness of the spacer divided by the cosine of the angle between the disk wall and the axis of rotation. Spacing between disks must be wide enough to accommodate the liquid flow without promoting turbulence and large enough to allow sedimented solids to slide outward to the grit-holding space without interfering with the flow of liquid in the opposite direction. The disk angle of inclination (usually in the range of 35 to 50°) generally is small to permit the solid particles to slide along the disks and be directed to the solids-holding volume located outside of the stack. Dispersed particles transfer from one layer to the other; therefore, the concentration in the layers and their thickness are variables. The light component from the spacing near central tube (18) falls under the disk; then it flows through the annular gap between tube (18) and the cylindrical end of the dividing disk, where it is ejected through the port (7) into the circular collector (4) and farther via the funnel (9) on being discharged to the receiver. The heavier product is ejected to the bowl wall and raised upward. It enters the space between the outside surface of the dividing disk and the cone cover (2); then passes through the port (8) and is discharged into the collector (3). From there, the product is transferred to the funnel (10). One variation of the disk-type bowl centrifuge is the nozzle centrifuge, so named because nozzles are arranged on the periphery or on the bottom of the bowl in a circle that is smaller in diameter than the bowl peripheral diameter. The Figure 17 (A) shows the conceptual operation of such a unit. The design is advantageous because it provides a high solids concentration in the discharge with nozzles of relatively large diameters. As centrifugal force is less in that area than near the periphery of the bowl, the concen- trated solids are ejected through the nozzles under a comparatively low pressure. Figure 17 (B) shows an actual unit being employed as a yeast concentrator. Substances such as yeast and bacteria are very slippery and slide easily; hence, they will not stick or plug up the channels leading to the nozzles. The fluid vortices and flow patterns characteristic of gas-cyclone operations are equally descriptive of liquid-hydroclones. However, the density differences between particles and liquids are significantly smaller than for gas-solid systems. For example, the density of water is approximately 800 times greater than that of air. This means that high fluid-spinning velocities cannot be employed in hydroclones as excessive pressure drop becomes a limitation. 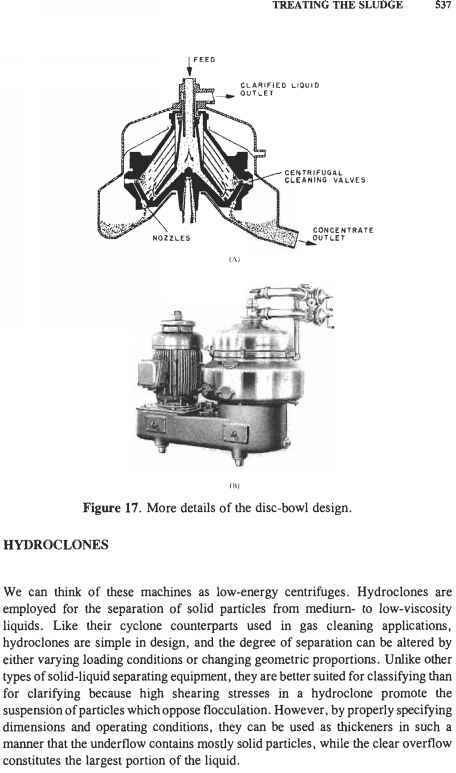 Obviously, the efficiency of hydroclones is low in comparison to gas cyclones. The design features of a hydroclone are illustrated in Figure 18. It consists of an upper short cylindrical section (1) and an elongated conical bottom (2). 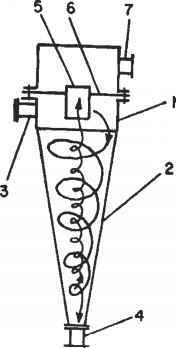 The suspension is introduced into the cylindrical section (1) through the nozzle (3) tangentially, whence the fluid acquires an intensive rotary motion. The larger particles, under the action of centrifugal force, move toward the walls of the apparatus and concentrate on the outer layers of the rotating flow. Then they move spirally downward along the walls to the nozzle (4), through which the thickened slurry is evacuated. The largest portion of liquid containing small particles (clear liquid) moves in the internal spiral flow upward along the axis of the hydroclone. 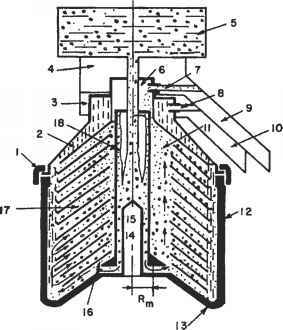 The cleared liquid is discharged through the nozzle (5) and fixed at the partition (6) and the nozzle (7). The actual flow pattern is more complicated than described because of radial and closed circulating flows. Because of peripheral flow velocities, the liquid column formed at the hydroclone axis has a pressure that is below atmospheric. The liquid bulk flow limits the upward flow of small particles from the internal side and has a significant influence on the separating effect. Hydroclones are applied successfully for classification, clarification and thickening of suspensions containing particles from 5 to 150 ^m in size. The smaller the hydroclone diameter, the greater the centrifugal forces developed and, consequently, the smaller the size particles that can be separated. The following are typical hydroclone diameters used for various general applications: for classification and degritting process streams, D = 300-350 mm; for thickening of suspensions, D = 100 mm; for clarification (where it is necessary to apply powerful centrifugal fields), D = 10-15 mm. In the last case, multiclones are employed. Figures 19 and 20 provide examples of hydroclones used in a degritting operations. Sand is accumulated in a grit chamber for intermittent blowdown. Such an operation could be used off of a cooling tower installation. Good separation of suspensions is achieved, especially in thickening and clarification, when hydroclones have an elongated shape with the slope of the cone equal to approximately 10-15°. At such a cone shape, the path of solid particles is increased as well as the residence time, which thus increases the separating efficiency. Figure 19. Hydroclone used in degritting water. The power required to operate a hydroclone is the horsepower needed for a pump that supplies the capacity V^ with an acceptable head of pressure. We have already discussed this technology back in Chapter 8 and will onlyadd a few more general comments. Thickening is practiced in order to remove as much water as possible before final dewatering of the sludge. It is usually accomplished by floating the solids to the top of the liquid (floatation) or by allowing the solids to settle to the bottom (gravity thickening). Other method of thickening are by centrifuge, gravity belt, and rotary drum thickening, as already described. These processes offer a low-cost means of reducing the volumetric loading of sludge to subsequent steps. 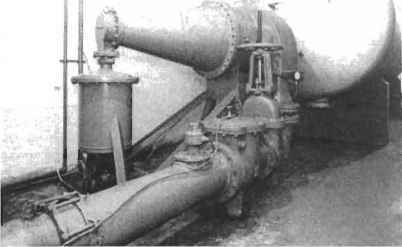 In the floatation thickening process air is injected into the sludge under pressure. The resulting air bubbles attach themselves to sludge solids particles and float them to the surface of an open tank. The sludge forms a layer at the top of the tank which is removed by a skimming mechanism. This process increases the solids concentration of activated sludge from 0.5-1 % to 3-6 %. Gravity thickening has been widely used on primary sludge for many years because of its simplicity and inexpensiveness. In gravity thickening, sludge is concentrated by the gravity- induced settling and compaction of sludge solids. 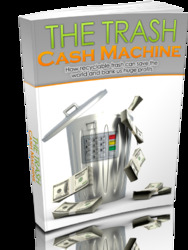 It is essentially a sedimentation process. 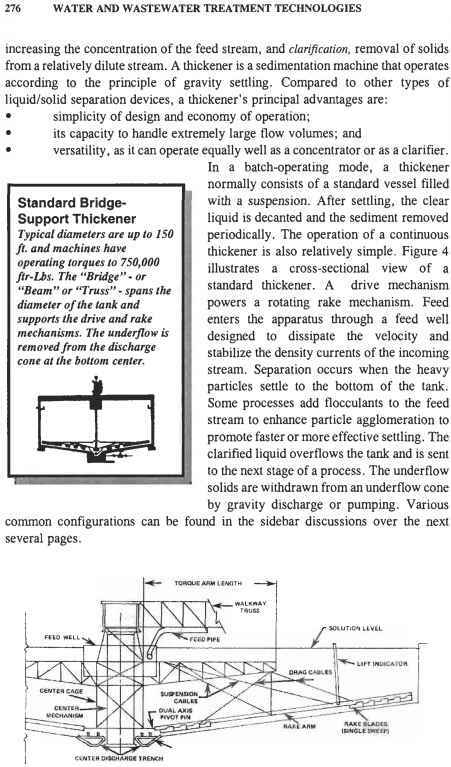 Sludge flows into a tank that is similar to the circular clarifiers used in primary and secondary sedimentation. The solids in the sludge settle to the bottom where a scraping mechanism removes them to a hopper. The type of sludge being thickened has a major effect on performance. The best results can be achieved with primary sludge. Purely primary sludge can be thickened from 1-3% to 10% solids. As the proportion of activated (secondary) sludge increases, the thickness of settled solids decreases. There are various designs for sludge thickeners. Figure 21 illustrates a tray thickener. As we see from the above descriptions there are a variety of technologies from which to select from for sludge dewatering operations. Each has its own set of advantages, disadvantages, and limitations in operating ranges. Selection greatly depends on the volumes and nature of the sludge. Table 3 provides a relative comparison between the principle mechanical dewatering techniques. Table 3. Comparison of the Advantages and Disadvantages of Mechanical Thickening Technologies. What is the reason for centrifuging pond water? Why is important to centrifuge pond water? Why should pond water be centrifuged? 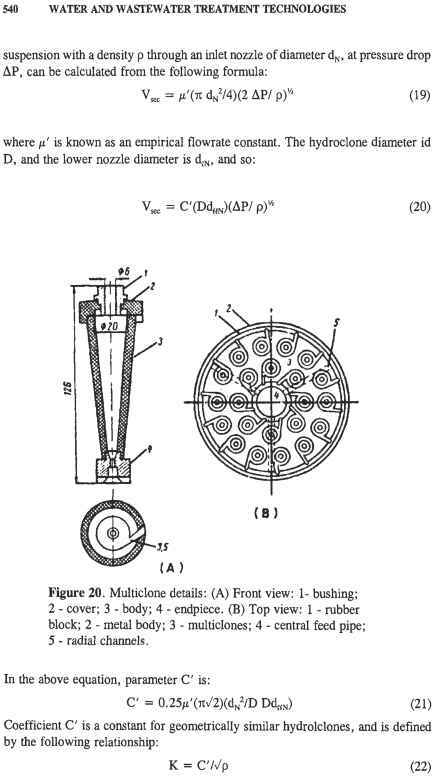 What is meant by conical disc centrifuge with diagram?